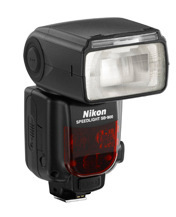 Nikon announced this week the SB900 speed light. At the moment no instruction manual is available, so we cannot yet do an in depth study of the flash unit. What we can do now is to take a first look, and compare information that we have to hand with the SB800 that we know so well. This flash unit is similar to the existing top of the range, the SB800, it has slightly lower power than the SB800, but can zoom its head over a larger range, and can give different light patterns to match FX and DX sensors, while the SB800 is really designed for the DX range. The quoted range that the flash can reach is the same, presumably brought about by being able to zoom more while the power is slightly less. From the figures on the specification it appears to cycle between photos about 20% faster, but this is always dependent on the batteries and state of charge at the time. The SB800 operates faster by adding a 5th battery, this has been done away with on the SB900. Its commander function and working with the creative lighting system appears the same. Its firmware can be updated via a D3 or D700. If you haven't got one of these then presumably its not able to be done without sending it away. The SB800 can be used with colour gel filters provided to correct the light, so for example you can use a filter to change to the same colour as light bulbs, reset the white balance on the camera, your flash now works with the available internal light. This means that at a wedding reception the bride and groom cutting the cake and distant background are both the right colour, rather than the background having an orange cast. This works but fitting the gels is not ideal. The SB900 has a filter holder, and is able to detect when a gel is in use, its colour, and feeds this information to some cameras. (We don't know which ones). However there are optional water guards that can be purchased for the D300, D700 and D3, so its these that this lash is most likely to have most compatibility with. The extra zoom is an improvement going out to 17mm and up to 200mm, the SB800 was from 24mm to 105mm, you then pulled out a wide angle diffuser to get to 17mm and put on the diffuser dome to get to 14mm. The longer zoom has no impact, but the wider angle zoom will make it quicker to use when wider angle lenses are used.